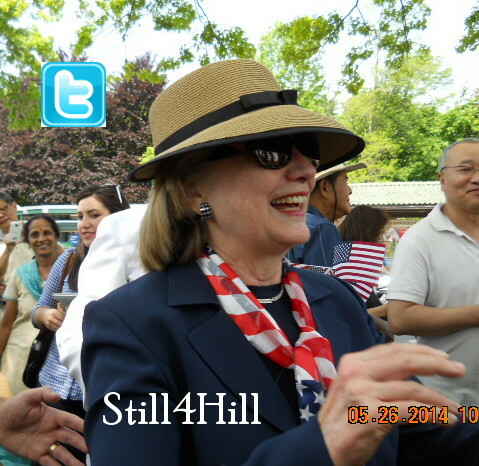 Once again it is clear, she needs that Hillary Rodham Clinton Museum/Library in Seneca Falls! Happy Valentine’s Day to Mme. Secretary and to all! 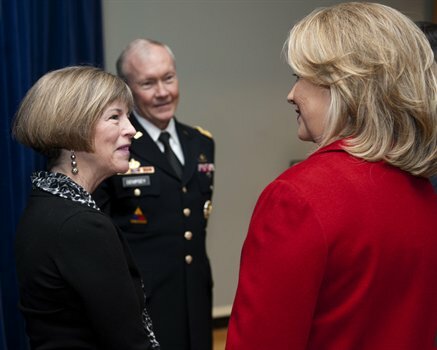 GENERAL MARTIN E. DEMPSEY: Secretaries, fellow general and flag officers, dedicated military and civilian servants here in the Pentagon, and our guests today from the Department of State, happy Valentine’s Day. (Laughter.) You know, the lore of martyrdom says that St. Valentine was actually martyred because he was marrying soldiers who were forbidden to marry by the Roman law of the day. So he was a man who loved soldiers and servicemen and women. 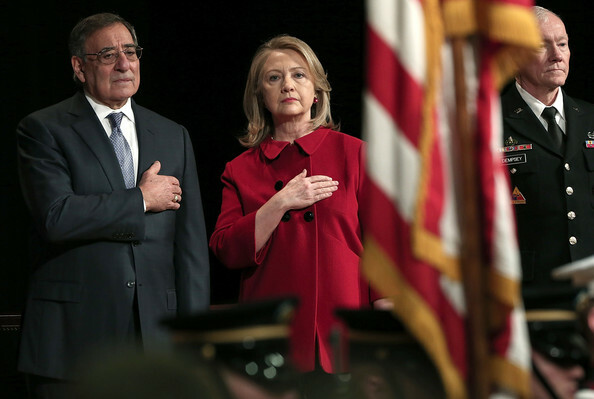 And it’s fitting in that regard that we’re here to honor our recent and great secretary of state, Hillary Rodham Clinton, who herself, by the way, has been an enormous champion of military servicemen and women and their families. So it is a privilege to honor one of our nation’s most dedicated public servants. Your favorite secretary of state, William Seward, didn’t earn quite as much recognition, although he did have that rather clever purchase up in Alaska, but you do have similar backgrounds — effective politicians with roots in New York and New York state, faithfully serving presidents that were once your rivals. Of course, Seward went on a trip around the world after he retired and, as you know, our secretary has flown enough miles to circle the globe 36 times. 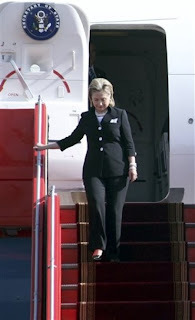 In fact, you’ve been airborne for the equivalent of 87 days during your tenure as secretary of state. That’s a lot of airplane food. (Laughter.) Along the way, you’ve been an exceptional representative of the men and women of the Department of State, working tirelessly in the aftermath of the Arab Spring and to ensure we had a strong coalition in Libya, building consensus for unprecedented sanctions against Iran, and which for those of us in uniform, we were very much appreciative of so that we can avoid the use of force, although remaining ready to do so, if necessary. And at home, you’ve strengthened your own institution, the Department of State. You’ve moved diplomacy into the 21st century. You’ve recognized that there are limits to hard power and that we need both hard power and soft power. You’ve harnessed innovative ways to accomplish engagement, including social media and global town halls, all the while remembering that it’s the investment of your personal time that builds relationships. And you’ve been one of the — as I said at the beginning, one of the staunchest supporters of the military, in my personal experience, more than any secretary of state in my career. Now, I expect you’ll slow down a bit. Maybe you can add a Tony or an Oscar to your Grammy award. (Laughter.) But before you go, I’d be honored if you would allow me to add to the list of your distinctions with the award of this Joint Staff Medal. Would you join me here, Madam Secretary? 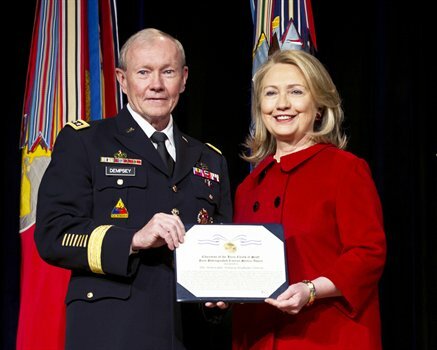 ANNOUNCER: General Dempsey will now present Secretary Clinton with the Chairman of the Joint Chiefs of Staff Joint Distinguished Civilian Service Award. Attention to orders. 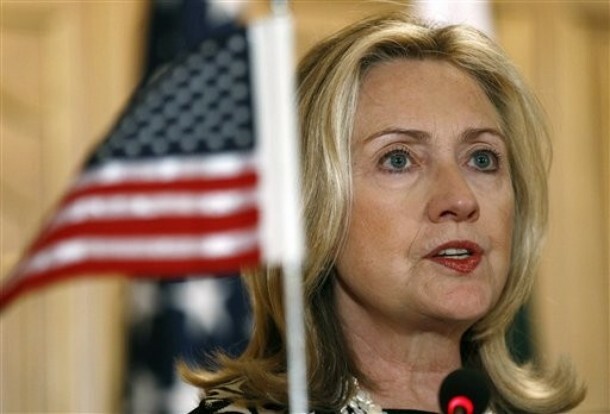 Secretary Hillary Rodham Clinton distinguished herself by exceptionally superior service while serving as the secretary of state from 21 January 2009 to 1 February 2013. 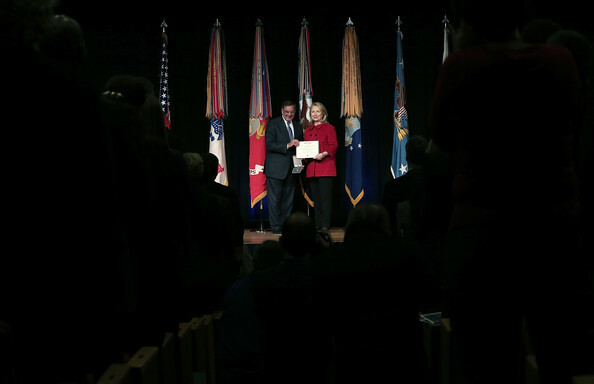 Throughout her tenure, Secretary Clinton has significantly provided outstanding support of all operational efforts of the joint military forces worldwide. Executing her smart power strategy of combining military strength with United States capacities in global economics, developmental aid, and technology, she enhanced the coordinated role of diplomatic and defense initiatives in the international arena. Capitalizing on this effort, she instituted the first Quadrennial Diplomacy and Developmental Review for her department that mirrored the military’s Quadrennial Defense Review, resulting in a consolidated interagency approach to all foreign endeavors. 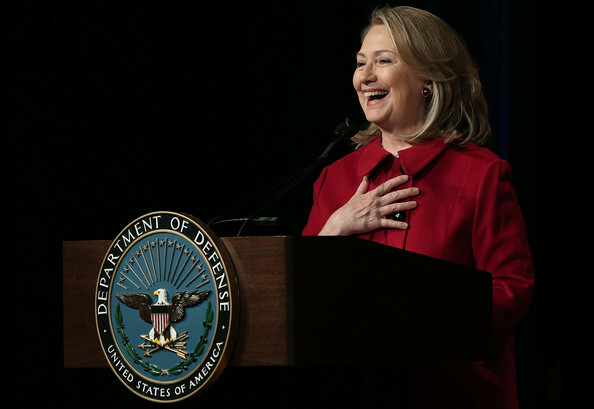 Secretary Clinton’s success in cultivating a more powerful Department of State, a larger international affairs budget, and expanded role in global economic issues greatly facilitated the role of our combatant commanders and the respect of our military troops on every continent. Visiting more than 100 countries and logging more than 500,000 miles of travel, she has been an exceptional example of our nation’s commitment to fostering better relations abroad and to directly supporting our developed troops in those areas. 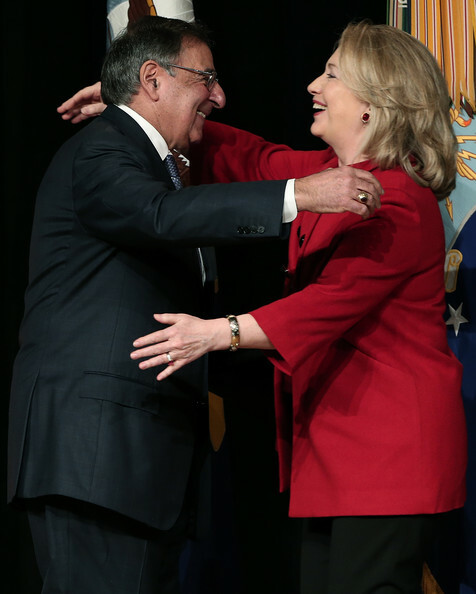 Ladies and gentlemen, the 23rd secretary of defense, Leon Panetta. 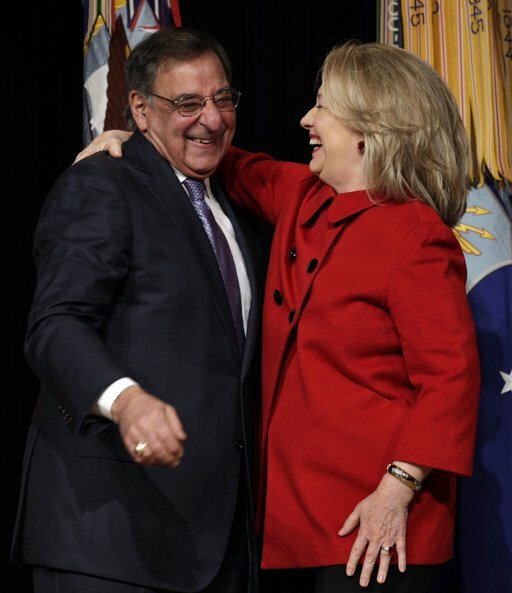 SECRETARY OF DEFENSE LEON E. PANETTA: Thank you very much. What a great honor to be able to recognize this very special person. All the leaders of the department, friends, colleagues, distinguished guests, we are truly delighted to welcome and to recognize someone who’s a dear friend to me and Sylvia, someone that I’ve been working with and working for over the last 20 years, a strong and dedicated partner of the Department of Defense, and I believe without question one of the finest public servants of our time. I feel like it’s Groundhog Day around here. (Laughter.) 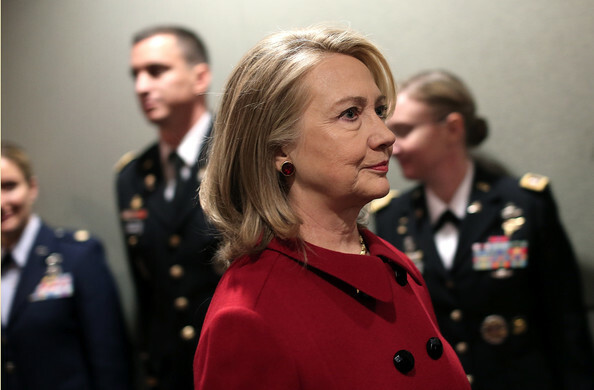 As first lady, as United States senator from New York, and as the 67th secretary of state, Hillary Clinton has been a stalwart advocate for the U.S. military. And that’s really why we honor her today. She’s been a champion of our servicemembers, our veterans, and she has been a forceful voice for American leadership in the world. On second thought, the only thing that has changed is that Hillary and I are a little older, perhaps a little wiser, a little less patient, particularly with political dysfunction, a little bit less tolerant of B.S. in general, and it is probably a good thing at this point in time that we have a chance to get some damn rest. For four years that I had the honor of serving in the Clinton administration, both as director of OMB and as chief of staff, I really had the opportunity to work with her in a very close, close way, because she was interested in the issues, she was involved in the important issues, obviously, particularly health care, women’s rights, children’s rights, all of the issues that she really fought for and pioneered, not only during that period, but for most of her life. And I saw firsthand her knowledge and her passion for the issues that we deal with. The issues that we confront in this country — I mean, obviously, you know, you can — you can study these issues, you can read about these issues, but the only way you really deal with the problems in our society is to have a passion for the problems that people face and try to find some way to help people achieve that better life. And that’s what I saw in her, was that passion to want to do that to try to help her fellow citizens. For all these reasons, I was truly delighted to have the opportunity when I was asked to join the Obama administration to come back and be alongside of her again as part of his national security team. As part of that team, I witnessed early on how hard she works, how dedicated she is, and how she truly developed, I think, one of the best diplomatic skills as a secretary of state of anyone that I’ve known in that capacity. She had the problem — she had the understanding to see the problems that people are facing. She had the ability to connect with the leaders of the world, to understand their challenges, to understand the issues that they had to confront. And it takes that. You’ve got to be — you’ve got to be a human being in these jobs. You can’t be a robot. You can’t just go through the act. You can’t just read the talking points. You’ve got to have a sense of what others are facing and who they are and what they’re about and what worries them. I think, having worked with President Clinton, one of the great capabilities he had was to always make other world leaders understand what is in their national interest, not what’s in the United States’ interests, but what’s in their interest. And Hillary had that same capability to make others understand what is in their interests, and that’s what made her so effective. In my past role as CIA director, she was someone who understood the importance of intelligence, understood the importance of intelligence operations, understood the importance of doing everything we could do to be able to go after those who attacked our country on 9/11. As a senator, she saw the terror of that moment firsthand. And I — she never lost sight of the fact that we had to go after those who attacked us on 9/11 and use every capability we have. And she was always there supporting our missions and supporting our operations, and I appreciate that — that support. Particularly during the bin Laden, which, you know, there is a movie out on this. (Laughter.) And, you know, the guy who plays me isn’t quite — quite right. (Laughter.) I mean, I was — my preference probably would have been Pacino. (Laughter.) But, you know, the truth — I — I’ve been asked — I’ve been asked about that, and, you know, the fact is, I lived — I lived through that operation. And there’s no way you can take 10 years of all of the work that was done, even in the last four years or the last two years up to that operation, that I was involved with. There’s no way you can take that and put it into a two-hour movie. The fact is that there was a tremendous amount of teamwork involved in that, both by our intelligence and our military officials, did a tremendous job working through all of those issues. But ultimately, it came down to a tough decision that the president had to make. And, God bless him, he made a very tough decision. But I can tell you that Hillary Clinton, sitting in that room, sitting with the National Security Council and trying to work through all these issues, a lot of different views, a lot of different opinions, but she was always there. And I deeply appreciated her support for that effort. It’s been even more rewarding to have become secretary of defense and developed a very close partnership with the State Department. 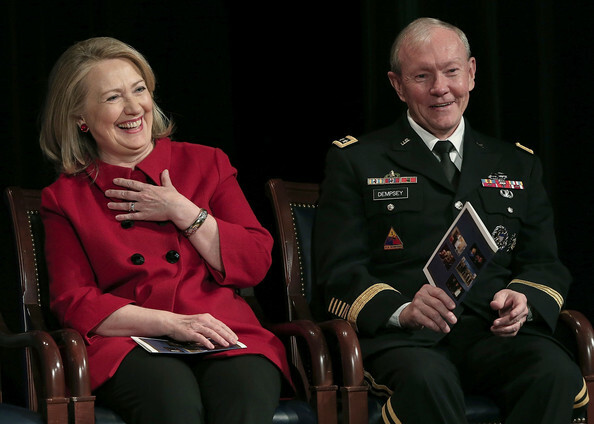 Actually, this partnership, I think, developed with my predecessor, Bob Gates, but as someone who’s been in and out of Washington for the last almost 50 years, I know from personal experience that rivalry can hurt the relationship between the Department of State and the Department of Defense. That kind of rivalry is very bad for both departments and the country, because you really do need a strong partnership between the State Department and the Defense Department. There’s too much at stake. You’ve got to work together. You’ve got to put your egos aside and work together on the issues that you have to confront. To do that is indispensable to America’s national security. Because of that, during the time that we worked together as secretaries, Hillary and I did all we could to sustain the tightest possible bonds between ourselves and our departments. Together, we have dealt with some very tough issues. We’ve dealt with a lot of the threats that confront this country across the world. We’ve taken part in some very tough debates and some very tough policy discussions on the Hill, at the White House, involving Afghanistan and Syria and terrorist attacks, and even on our own defense strategy, including the whole issue of Asia Pacific rebalance. We’ve also traveled to some of the same meetings with foreign counterparts, here, overseas, NATO summits, the Australia-U.S. ministerial, heads of state visits. I don’t think too many people recognize how long meetings and sleepless travel and endless conferences and tough questioning can bring two people together, because most of the time you’re trying to figure out where the hell you’re at. You’re walking in circles. And you’ve got to look at each other and say, we now have to face up to what we have to do to try to deal with the situation that confronted us. In all of those discussions, Hillary has always brought us back to Earth, with the right argument at the right time. 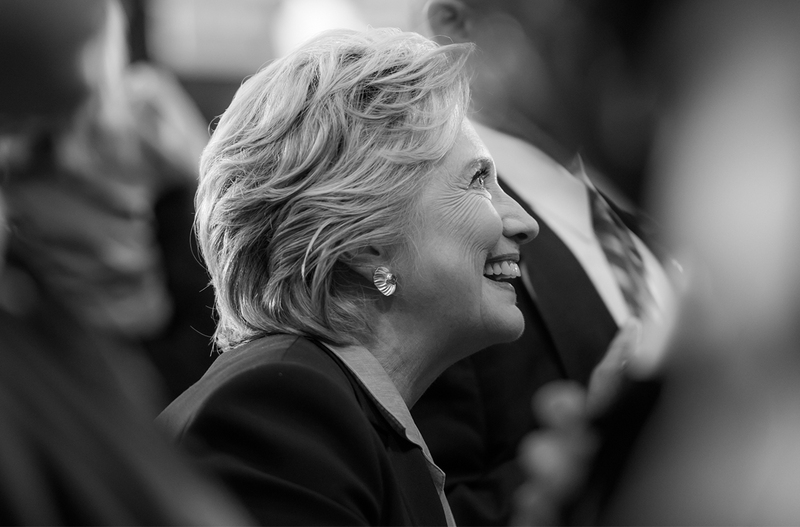 Her ability in the end to be very pragmatic about what it takes to get something done is, I think, part of her genius as — as a leader, the ability to cut through it, the ability to listen to all the arguments, but in the end, to cut through it and make the decision that has to be made. She is honest. She is forceful. She’s a persuasive voice for doing what’s right for the American people. We have fought on opposite sides of the issues. I’d sure as hell rather have her on my side than be against me, because she is so good in making her arguments. More often than not, she and I have stood side by side in making our recommendations when the president has faced difficult choices in Iraq and Afghanistan and Libya and the Middle East. 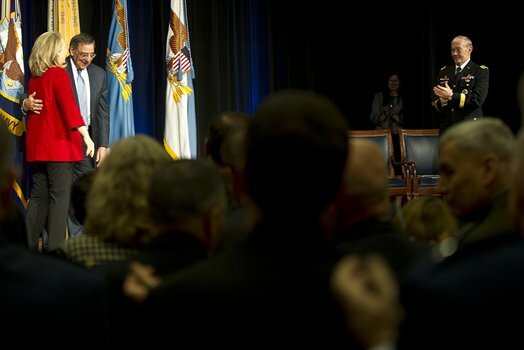 And because of her leadership, our nation’s diplomats and our development experts are working toward a common mission with the men and women of the Department of Defense, and I’m confident that our successes will sustain the bonds that we have built between the Department of Defense and the State Department. Our personnel are putting themselves at risk from Afghanistan to North Africa, from the Middle East to Asia Pacific, and making great personal sacrifices in order to prevent conflict, to advance the cause of peace and security, and to help achieve the American dream of giving our children a better life. That dream has been Hillary Clinton’s dream. And today, the Department of Defense recognizes her for her great work in helping all of us better defend this nation and to provide that better life. In my time in and out of government, Hillary Clinton is one of the most informed, most passionate, and most dedicated public servants that I’ve had the privilege to serve alongside. She has devoted her life to expanding opportunities for everyone, to build a better future for this country and the world, because she believes everyone deserves the chance to fulfill their dreams and their aspirations. And in many ways, I have to tell you, it was her inspiration that encouraged me to move forward to be able to bring down the last barriers for women in the Department of Defense and to give them the ability to have a chance to engage in combat. I thank you for that inspiration. Seventy years ago, the only person to serve as secretary of state and secretary of defense, George Marshall, was honored with the Nobel Peace Prize. When he accepted the award, only months after the armistice on the Korean peninsula, Marshall reflected that — and I quote — “A very strong military posture is vitally necessary today, but it is too narrow a basis on which to build a dependable and long-enduring peace,” unquote. Marshall went on to say that, “Perhaps the most important single factor will be a spiritual regeneration to develop goodwill, faith, and understanding among nations. There must be wisdom and the will to act on that wisdom,” unquote. Today, just 70 years ago, it is now clear that we need to maintain a strong military force to deal with the unstable and unpredictable and undeniably dangerous world that we live in. But it is equally clear that we must enhance our other key levers of power, our economic and diplomatic power, if we are to truly achieve peace in the 21st century. Delivering on that vision will require wisdom, and it will require a will to act, qualities that Hillary Clinton exemplified throughout her career and as secretary of state. Her legacy is the inspiration, the wisdom, and the will to fight for the American dream, and that, very simply, is why we honor her today. 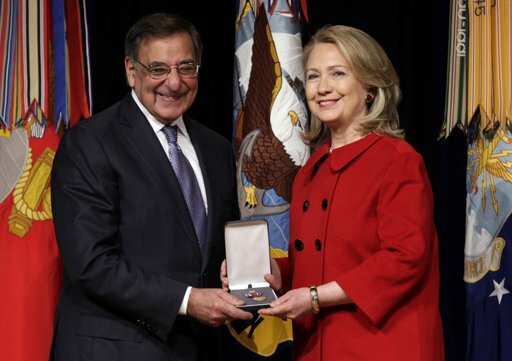 ANNOUNCER: Secretary Panetta will now present Secretary Clinton with the Department of Defense Medal for Distinguished Public Service. Attention to orders. 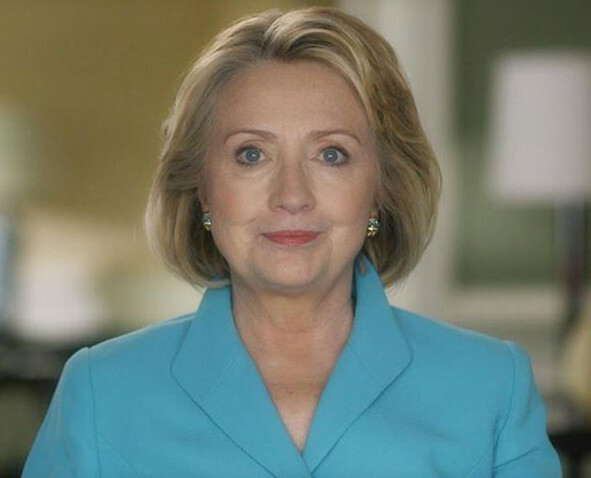 The Honorable Hillary Rodham Clinton is recognized for distinguished public service as United States secretary of state from January 2009 to February 2013. 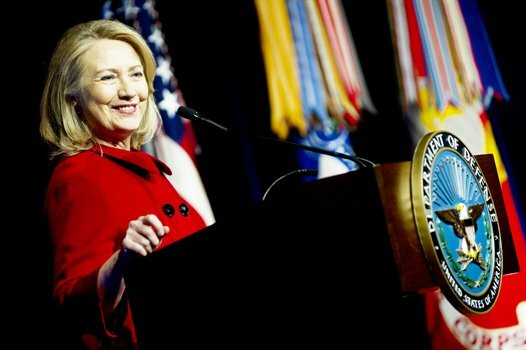 Secretary Clinton played an indispensable role in formulating and, with great success, implementing the president’s United States national security, foreign and development policies in an era of dynamic shifts in global affairs. 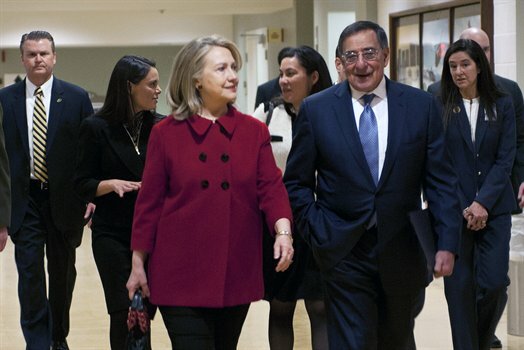 Applying an innovative, smart power approach, Secretary Clinton led efforts to invigorate traditional alliances, engage emerging powers, and develop new partnerships to advance American interests, security, and values. Her sound counsel, strategic vision, and steady hand guided the United States response to the global economic crisis, political changes in North Africa and the Arab world, and new opportunities and challenges in Asia. She provided invaluable leadership to United States efforts in Iraq and Afghanistan during the security transitions in those countries. Ladies and gentlemen, the 67th secretary of state, Hillary Rodham Clinton. Thank you. Well, this is certainly a memorable Valentine’s Day, I have to tell you. It is such an honor and personal privilege for me to be here with people whom I admire, respect, and just like so much. 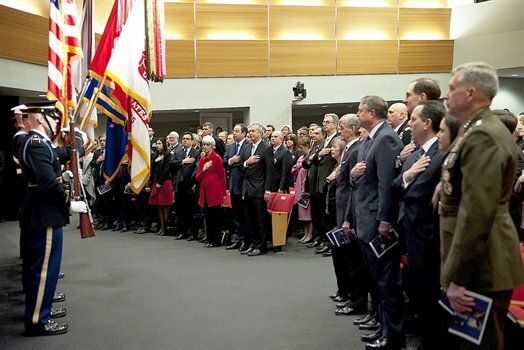 Secretary Panetta, Chairman Dempsey, all of you military and civilian leaders alike, thank you for what you do every day to keep our nation safe and strong. It has been a real pleasure for me to work with all of you, starting out with Secretary Gates and Chairman Mullen, now working with Secretary Panetta, Chairman Dempsey, and let me also thank Vice Chairman Sandy Winnefeld. You have been great partners and colleagues. It has been a singular honor of my life to be able to work with all of you and to try to do what we can in a time of such momentous change and even turbulence to chart a steady course for the nation that we serve and love. I also want to thank my traveling companions, General Paul Selva and Admiral Harry Harris. Some of you may not know that Paul and Harry had to fly all over the world with me, representing, first, Secretary Gates and, then, Secretary Panetta. I’m still trying to figure out why they got to get off the road halfway through my four-year tenure and switch places, but whenever there was a problem with the plane or any other issue that arose, I would always turn to them to help us fix it. Harry, as you know, is Navy, but he came through time and time again to get us — (Laughter) — back in the air. And I’m grateful to you. I also want to say a special word of thanks and greetings to my former colleagues from the State Department who are here. It is bittersweet, as I’ve said to them before. The senior leadership at the State Department over the last four years is really responsible for all the very kind and gracious words that were said about me. And they worked seamlessly, not always in agreement, but always getting up every day to work toward our common objectives with the DOD senior leadership here today. So I want to thank my friends and colleagues with whom I served over the last four years. This is a tremendous honor for me. Some of you know that I have had the great privilege of knowing Leon for what he said was 20 years. I think Al Pacino would have been more appropriate, also, but on every step along the way, from his service in the Congress to the White House to the CIA to the Pentagon, he has demonstrated the highest caliber of integrity, wisdom, and patriotism, and he’s been not only a great partner, but a great friend. I think you can now — you’ll have to postpone for a little while removing the eight-second delay for the censors until he actually does leave the building. (Laughter.) But what he said about humanity, about being a human being in these roles is worth repeating. It is easy to get so caught up in the work and the intensity, the drive necessary to work those long days and short nights, that it is sometimes too easy to forget why we do what we do, both military and civilian. For many of you, it has been a career choice, both my colleagues from the Defense Department and from State. For others of us, you know, it is something that we came to later and were involved in, luckily, that gave us a chance to serve. 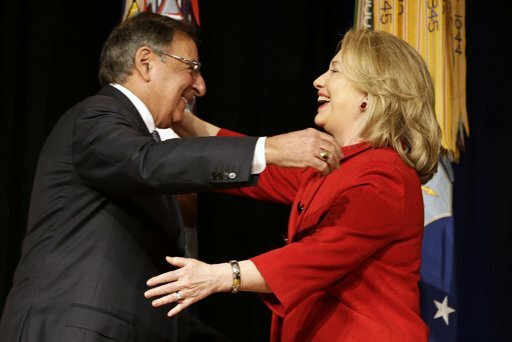 But for all of us, remembering, you know, why we do this work and how important it is to the future, especially future generations, is something Leon Panetta has never forgotten. And I know that as Leon does eventually head back to California, he will, along with his absolutely wonderful wife, Sylvia, continue to use the Panetta Institute to help train up the next generation of leaders. I also want to say a special word of thanks to Chairman Dempsey. I’ve really enjoyed working with Marty Dempsey. Our men and women in uniform have no greater champion, and it has been for me a great treat getting to see him in action and also to meet you, Deanie, and to — as I said to you out in the hall, to see you with some of your grandchildren coming out of Easter Egg roll a year or two ago. Now, it is no secret — or if it had been, Leon spilled the beans — that historically the Departments of State and Defense have not always had the best working relationship. In fact, I have been quite surprised and even amused in talking to some of my former predecessors who are bewildered that we get along and who say things like, you know, that’s odd, as if I’m somehow letting down my side that I — I am not, you know, causing you as many problems as I can, trying to push you offstage, as if that were possible. But I have been around this town, certainly, for long enough to know that it is an unfortunate historical precedent. And so when I became secretary four years ago, I was determined to do my part to change that. You know, I like being on the American team, not the State Department team, not the Defense Department team, not the partisan team. I like being on the American team. And I think when we take these positions and take that oath of office, we really pledge to be part of the American team. Now, we will have different perspectives, different experiences that we bring to the tables that we sit at. But we should walk out of those rooms determined to be on that team for our country and for the president we serve. So from day one, we have formed the strongest partnership in most living memories. And I do hope that continues. Now, Secretary Gates and Chairman Mullen set the tone by emphasizing the importance of fully funding the State Department and USAID, quite a remarkable position for a secretary of defense and chairman of the Joint Chiefs to take. And Secretary Gates, even before I was secretary, made quite an important speech talking about how there were more members in military bands than there were diplomats and that we had to increase the strength of our diplomatic corps and our development experts in order to do our part. 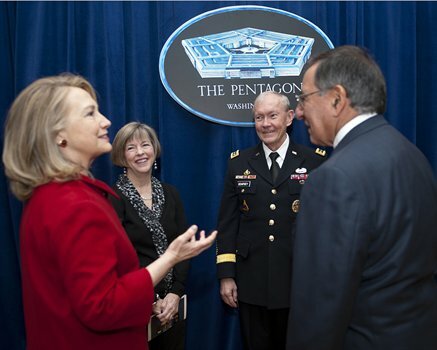 Now, Secretary Panetta and Chairman Dempsey have continued to build our partnership even further. They have been steadfast advocates for integrating the 3 D’s of our national security, defense, diplomacy and development, into a unified smart power approach. And because of these efforts, our diplomats and development experts all over the world are working more closely than ever with all of our soldiers, sailors, airmen and Marines. Whether it’s advancing the transition in Afghanistan or responding to the triple disaster in Japan or pursuing terrorists in North Africa, we have seen that America is stronger and more effective when we work together. And I think we have gone a long way to restore America’s global leadership and to make progress on some of the great challenges we face, from taking the fight to the leadership of Al Qaeda to reasserting the United States as a Pacific power. And we have pioneered a nimbler, more innovative, more effective approach to foreign policy, so I am enormously proud of what we have achieved, and I’m confident about the future, having left the State Department in the capable hands of Secretary John Kerry, himself an accomplished diplomat and decorated Navy veteran. So I believe that we’ve established a strong base for this kind of collaboration, which I think is essential in going forward against the challenges and threats that we face. Now, I happen to have grown up in a Navy household. During World War II, my father was a chief petty officer, training sailors at Great Lakes Naval Base before they were shipped off to the Pacific. And he never forgot — and used to tell my brothers and me — how it felt watching those young men get loaded onto troop trains, knowing that many would never return home. After he died many years later, I received an outpouring of letters and photographs from some of the men he had trained who had served and returned home and built lives and families of their own. I just couldn’t believe that that experience, being yelled at by my father — (Laughter) — was so formative for them. And I was glad to hear it, frankly. I saw this same sense of dedication and duty when, as first lady and then senator from New York, I visited with servicemembers and their families all over the world. Then I was honored to serve on the Armed Services Committee and to work closely with men and women throughout this building, and in particular with Secretary McHugh, who had become a great partner with me on behalf of our military bases and personnel in New York and what we did to try to keep moving forward in improving readiness and modernizing capabilities. I was so impressed by the Quadrennial Defense Review that I did launch a similar effort at State called the QDDR, or the Quadrennial Diplomacy and Development Review. And now four years as secretary of state has ended, but my appreciation for everything you do is deeper than ever. I’ve had the chance to visit with many of our forces overseas, sometimes in the company of some of you in the audience today, especially, of course, in Afghanistan, but also here at home, from Hawaii to Norfolk to Annapolis. This past May, I had the chance to go down to Tampa and speak to a special operations conference sponsored by Admiral McRaven. And I had the chance then, too, to thank them for their remarkable service and to talk about the complex and cross-cutting threats that we face. So we do have to keep innovating and integrating. We have to get our house here at home in order. We have to avoid devastating self-inflicted wounds. We have to remain committed to upholding America’s global leadership and our core values of freedom and opportunity. Now, Leon and I have both seen this as we travel the world. American leadership remains respected and required. There is no real precedent in history for the role we play or the responsibility we have shouldered. There is also no alternative. But I often remind myself that our global leadership is not our birthright. It has to be earned by each successive generation, staying true to our values and living up to the best traditions of our nation. Secretaries and presidents come and go, but this responsibility remains constant. It truly must be our North Star. So in the years ahead, we will be looking to all of you and to your successors to carry this mission of American leadership forwards, to keep our nation strong, free and exceptional. So thank you for this tremendous honor that has been bestowed on me by the chairman and also the honor by the secretary. I thank you all for your service, and I thank both of you and others of you here today for your friendship. Let’s wish our country godspeed. And please extend to all with whom you serve my deepest gratitude, not as a retired public official, but as an American citizen. 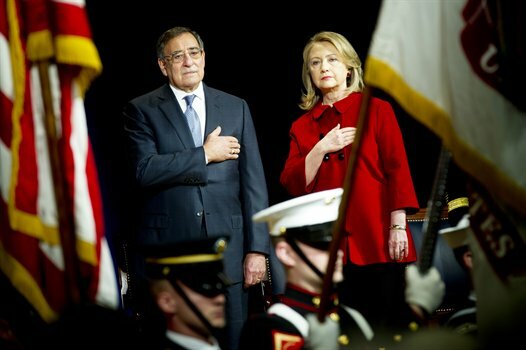 It always amazes me, and I suppose it should not, that when Hillary Clinton’s supporters and fans feel she has been too long under the toxic cloak of the Obama administration and start agitating for her to resign, they do not seem to realize that of all her responsibilities and initiatives there is one that singularly ties her to the post until its completion. I refer, as I have so frequently in so many venues to her Quadrennial Diplomacy and Development Review – dubbed The QDDR – initials that tumble from her lips at the speed of a bullet. I say I should not be amazed that so few know not only about the QDDR but also the extent to which Mme. Secretary is invested in it because at the time she announced it many of us Hillary bloggers fell into the trap of distraction that had been carefully set to divert our attention from this historical and ambitious effort. While I should have been posting the text of certain presentations here, I was busy over at The Department of Homegirl Security battling the “Vampire Tales” as I had dubbed the toxic memes that would not die. This post illustrates what we were battling as well as any: The Heart of the Mean Season. So to make up for past failings, here is a quick review of the QDDR effort, the reason Hillary Clinton cannot resign her post just yet. Many will recognize this picture, few will know the context. Wearing one of those adorable expressions only Hillary Clinton can make, and with the Elbow of State encased in the official Sling of State, she appears to be having a friendly chat with her State Department employees. The truth is that she was embarking on an extensive tour of every bureau and agency in the department and at USAID in order to tighten efficiency and better coordinate efforts among them where responsibilities overlap. She commenced this monumental (and historical) process in a high-wire act worthy of The Flying Wallendas, by presenting and explaining the initiative to the State Department and USAID personnel in two face-to-face town hall meetings over a three day period. Anyone whose department has ever been under review can appreciate the predisposition of the folks filing into the town hall meetings. 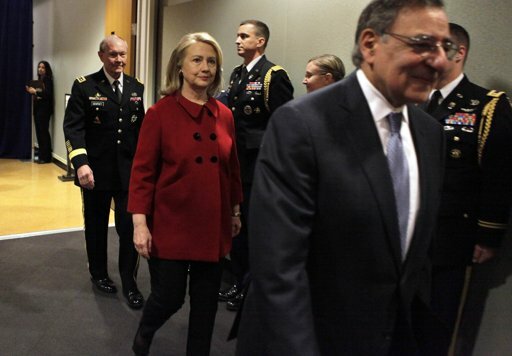 The idea came to her based on her tenure on the Senate Armed Services Committee. The Department of Defense presented a Quadrennial Defense Review every four years to keep that sprawling department in check and well-coordinated. Our innovative SOS decided that if such a review keeps the Pentagon streamlined and efficient, it might be a good idea to establish a similar tradition at State, a department that had been allowed to grow unchecked from the days of Jefferson into the 21st century. It was a truly historical, courageous, and brilliant decision. It was her decision. Any other effort on her part, from winning back the trust of the Chinese, to reaching out to the Muslim world, from brokering peace in the Middle East to encouraging friendship and trust between India and Pakistan might be interpreted, on the larger scale as assignments, a carrying out of Obama administration policy. This one thing. This one endeavor was entirely of her own making. It was and is the single signature enterprise by which one very spectacular and accomplished Secretary of State, the Honorable Hillary Rodham Clinton, intends to leave her mark forever upon the department she leads like no other before her. One thing Hillary says about herself and everyone knows about her is that she is not big on quitting. Well, our government posts are not filled by Presidents or Secretaries for Life (as in some countries). There is turnover. There is transition. One day Hillary will walk away from State, and perhaps there will not yet be a Palestinian State or (God forbid) a ratified Start Treaty. Those are administration initiatives, not hers, and will be carried forward. But there will be an established tradition of quadrennial review at the State Department and USAID of diplomatic and development efforts. Hillary will make sure of that. When that is established, and not a single New York Minute before, she will consider herself free to go. Now, to atone for my negligence, here are the videos of those two dramatic and excellently presented town hall meetings (I did post the State Department one on July 10, 2009, but should have given it much more fanfare and should have posted the text.) This is Hillary’s signature work at State, and it is outstanding. For a preview into some of what the QDDR will yield, see this Washinton Post article by Carlos Lozada. Yes, Persuasion! That’s our girl! Very persuasive, I think. MR. RAMSEY: Good evening, everyone. It is my honor and pleasure, on behalf of the entire Board of Trustees, to welcome all of you this evening. Tonight’s event highlights all that is right with our country: dynamic leaders; bright, engaged students; and a fantastic venue right here in the heart of the nation’s capital. MR. KNAPP: Good evening. Distinguished members of the international community, Chairman Ramsey, university trustees, faculty, staff, alumni and students of the George Washington University, it’s a pleasure to welcome you to our historic Lisner Auditorium. Today, we are honored to host what promises to be an illuminating as well as unprecedented discussion. 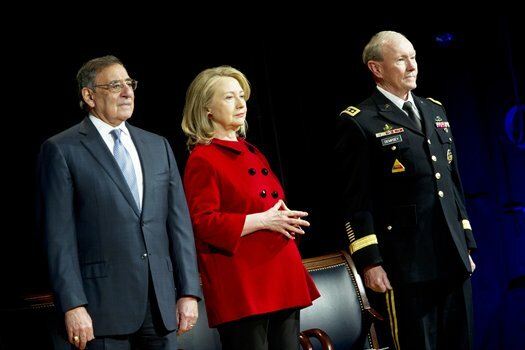 This is a unique opportunity for the George Washington community and for the world to hear firsthand from two sitting cabinet members, Secretary of State Hillary Rodham Clinton and Secretary of Defense Robert Gates, two leaders who every day shape America’s diplomacy and presence in the world. With our front row seat to history, the George Washington University is privileged to serve as a convener of important discussions like this one. Hosting such events is a key part of our public service mission as the largest university in the nation’s capital, and it provides a unique educational opportunity for our students, many of whom are with us here this evening. I was impressed last week when walking to my office early one morning, I saw a large crowd of students lined up outside this auditorium. I understand the tickets to the event sold out in literally five minutes. MR. SESNO: Good evening, everybody, and welcome to Lisner Auditorium. Welcome to what will be an extraordinary event. You can only imagine the view from my office across the street when I looked down a few days ago and saw that line wrapped around this building for people eager to get tickets. For those of you who were on that line or slept out overnight, I hope you’ve caught up on your sleep, but I’m glad you got your tickets. I want to thank President Knapp. I want to thank Dean Michael Brown of the Elliott School of International Affairs, and Dean Peg Barratt for also helping to sponsor this event and make this possible. Dean Barratt talks about our role at the university here to engage Washington and engage the world, and I can think of no better way and no better time to engage the world than with the discussion that we’re going to have here this evening. 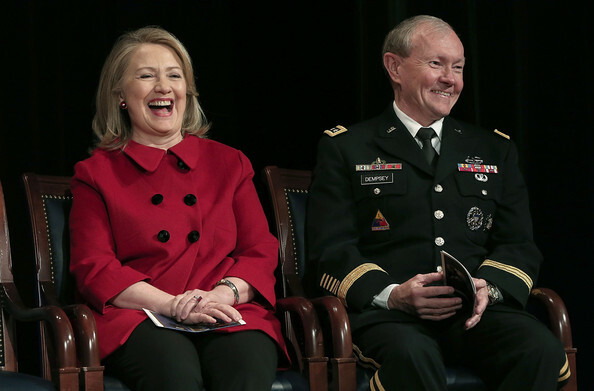 Our 67th Secretary of State Hillary Clinton, our 22nd Secretary of Defense Robert Gates, two people of extraordinary depth and talent, and who have served this country for a very, very long time. We’re going to talk about some topical issues. We’ll talk about some very strategic and important issues. We’ll talk about smart power, what that means, and how they’re pursuing it. We’re also going to take some of your questions later in the evening. We are going to take breaks. You’ll see us taking little mini-breaks here, because, as you can tell, we are going to be – and as you know, we are going to be broadcasting on CNN. This as an hour-long special will air tomorrow at 3 p.m. eastern time, not just in the United States but around the world. Christiane Amanpour has a new program, and I kind of think maybe it’s because she was here last year to be with the five former secretaries of state that now she has this new show. But we will be taking breaks periodically. We’re not stopping. We’re just helping CNN with their edit. At this time, I would like to have you join me in welcoming my friend, my colleague, and one of the world’s greatest journalists, Christiane Amanpour. (Applause.) And if I didn’t tell you, Christiane’s show reaches 330 million households worldwide, so that gives some real heft and depth to this conversation. Welcome. MS. AMANPOUR: Lovely to be here. 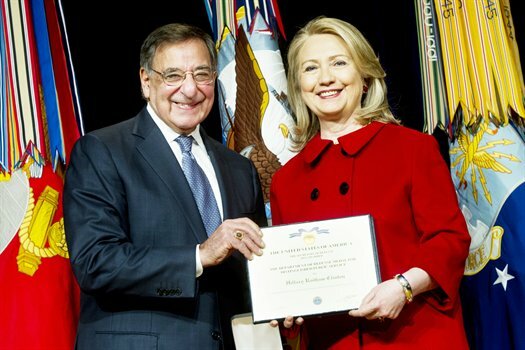 MR. SESNO: It’s now my great privilege and pleasure to welcome to our university Secretary of State Hillary Clinton, Secretary of Defense Robert Gates. (Applause.) Madame Secretary, we’re going to pose for one more set of pictures, I think, with President Knapp and Chairman Ramsey before we get started, if we can. Christiane, perhaps you want to go on that side, and then we’ll be flanked by our fearless leaders here. Here we go. Well, let me welcome you both to the George Washington University. Thank you for being here. There will be no quizzes or exams after this, but we’ll try to have this as intriguing a conversation as we can. As I mentioned, Christiane’s got her program and we’re very much looking forward to seeing it there and around the world. I should also mention that America Abroad Media is turning this into a hour-long special. It will be distributed both domestically and internationally as an hour-long special on public radio and available to all other media, many of whom are here. So welcome. MS. AMANPOUR: So welcome. Welcome to you both. We’ve been sort of searching back in the annals of recent history and we can’t really find an example such as this where two sitting secretaries of state in charge of some of the most important briefs at the moment are sitting on stage in an interview such as this. So we just wanted to start by asking you how often do you speak together, what is it like working together? Do you pick up the phone and call each other whenever you like? How does it work? SECRETARY CLINTON: Well, we actually spend a lot of time together, and it is mostly at the White House in the Situation Room, which is this room that is especially set up for secure conversations – a windowless domain that we spend a lot of time in – and we also talk outside of those formal meetings. But it’s been a real pleasure for me to work with Bob over the last nine months. And a lot of the decisions and the reasons we end up in the Situation Room are pretty serious and challenging ones to tackle and try to come up with our best advice to the President, but Bob has a lot of experience, which I certainly appreciate, and also a good sense of humor, which makes everything a little bit better. MS. AMANPOUR: Precisely why we are. MR. SESNO: In fact, sometimes it was even worse than that. SECRETARY GATES: And it could get pretty ugly, actually. And so, I mean, it’s terrific to have the kind of relationship where we can talk together, because the truth of the matter is if the bureaucracies realize that the principals get along and work together and are on the same page, it radiates downward. And when people discover it’s not career-enhancing to try and set your principal’s hair on fire because the other person is doing something horrible, it makes a huge difference, and not just at this level, but all through the bureaucracy and the interagency. MR. SESNO: So what is it that by doing this and by sending this signal from the top that you are trying to change? You both talk a lot about taking the country in new directions and for the 21st century, but what are you trying to prove by this in terms of actual implementation? SECRETARY GATES: Well, I don’t think we’re trying to prove anything. It’s just we get along, we work together well. I think it starts with, frankly, based on my experience, the Secretary of Defense being willing to acknowledge that the Secretary of State is the principal spokesperson for United States foreign policy. And once you get over that hurdle, the rest of it kind of falls into place. And I think it’s really just a matter of this is the way we work together. As I say, we’re not trying to prove anything. It’s just this is what works and this is how government ought to work. SECRETARY CLINTON: Frank, I think that when Secretary Gates was given this responsibility in the last administration, he immediately began making clear that we had to have a coherent and unified foreign policy; the instruments of American power in defense, diplomacy, and development needed to be working together. And before he was a part of the Obama Administration, he had gone on record several times talking about the need for us to work more closely together between our civilian capacity and our military force. So when President Obama asked Bob to stay on, I knew that he understood the kind of whole-of-government approach and was really dedicated to trying to make sure that we were doing the best we could for our country. His years, his decades of service to America, give him a perspective that is very useful. And I mentioned this before, but Henry Kissinger – following up on what Bob had said – said that it was the first time that he found that the State Department, the White House, and the Defense Department, mostly through Bob and me and General Jones, were all saying the same thing. Now, that doesn’t mean we don’t have differences of opinion or see issues from slightly different perspectives. But we have an enormous amount of respect for each other, we listen to each other, and we work through, give our best advice to the President, and then support the President’s decisions. MS. AMANPOUR: So given that you’re involved in a very difficult situation right now – the war in Afghanistan, a place where I’ve spent a long time – I want to start by asking you: Do you think you can win there? Both of you, I’d like to know whether you think you can win. SECRETARY CLINTON: Well, I think, Christiane, what we’re looking at as we meet to advise the President is what do we need to do in Afghanistan and Pakistan, because we see the region as the area of concern that will promote American interests and values, protect our country, as well as the allies and other interests that we have around the world. So I think it’s a very thoughtful analysis about what is it we need to do. And we’re trying to look at it from the ground up and make sure that we’re examining every assumption, because what’s important is that at the end of the day, the President makes a decision that he believes in, that he thinks is going to further our core objectives of protecting our country, preventing attacks on us, trying to protect our interests and our allies. And that’s what we’re attempting to do. MS. AMANPOUR: Secretary Gates, the majority of the American people believe that America can win in Afghanistan. Do you think America can win in Afghanistan? SECRETARY GATES: From the time I took this job, I have tried both in Iraq and Afghanistan to avoid terms like “winning” and “losing” because they become very loaded in our domestic debate, but they also become loaded around the world. I think the key thing is to establish what our objectives are, and can we achieve our objectives. And the answer to that question is absolutely. Has any of that changed from then till now in this review? SECRETARY GATES: I don’t think so. MR. SESNO: So staying the course and having this government survive and not fall to the Taliban, and disrupting and dismantling al-Qaida is the objective, is the goal of this review that you’re going through? So I think what we’re going through in asking ourselves – okay, we know what the goal is, is what we’re doing most likely to achieve that goal? – is what a very decisive and intelligent commander-in-chief would do. So we’re going to come up with what we think is the best approach, but the goal remains the same. SECRETARY GATES: I think it’s important to remember that as Secretary Clinton said, that the President indicated very explicitly at the end of March that we would revisit the strategy after the election in Afghanistan. Now, at least a couple of things have happened. One is the new commander has done an assessment and found the situation that – in Afghanistan that is more serious than we anticipated when the decisions were made in March. So that’s one thing to take into account. The other is, clearly, a flawed election in Afghanistan that has complicated the picture for us. And so it seems to me under these circumstances, and particularly – I mean, let’s be honest, the President is being asked to make a very significant decision – and the notion of being willing to pause, reassess basic assumptions, reassess the analysis, and then make those decisions, seems to me, given the importance of these decisions, which I’ve said are probably among the most important he will make in his entire presidency, seems entirely appropriate. MS. AMANPOUR: So you’ve both spoken just now very highly of General McChrystal. You’ve talked about the new commander, his important reassessment, and changes on the ground. There are obviously two basic choices that you have, either to go all in or to scale back. Some who are talking about scaling back talk about less nation building, talk about more predator strikes, perhaps more focus on Pakistan rather than in Afghanistan. GENERAL MCCHRYSTAL: No. And the first reason is I believe you have to navigate from where you are, not from where you wish you were. We are in Afghanistan and we’ve established relationships, expectations, both with the Afghan people, the Afghan Government, in the region. And I believe Afghanistan has its own value, its stability, now. MS. AMANPOUR: So do you believe that by scaling back over the next 12 to 18 months, you can win in Afghanistan? SECRETARY GATES: Well, first of all, I think as you know, we are not going to talk about where the President ought to go or the options in front of him. I mean, I think I just gave a speech this morning in which I said that the President deserves the candid advice of his senior advisors, both civilian and military, but that advice should be private. All I will say is, first of all, I think Stan McChrystal is exactly the right person to be the commander in Afghanistan right now. He was my recommendation to the President to lead this effort, and I have every confidence that no matter what decision the President makes, Stan McChrystal will implement it as effectively as possible. MS. AMANPOUR: Could I ask you about the nature of private advice? You’ve said it, others have said it, General Jones said it this weekend. You know that during the lead-up to the Gulf – to the second Iraq war in 2003, many of the one-star, two-star, other generals and military officials, didn’t stand up and challenge the premise that only a certain amount of troops were necessary, and that was deemed to have been a big mistake and deemed to have wasted a lot of time, for instance, in Iraq. Do you not think that General McChrystal must give his honest assessment in public because of what happened when that honest assessment was not given? SECRETARY GATES: I think the important thing is for the President to hear the advice of his commanders and to have the advantage of hearing that advice in private. In all the decisions that were made during the surge in Iraq, the President – I structured a process where the commander in the field, General Petraeus, the then-commander of Central Command, and the Joint Chiefs of Staff each had an opportunity to present their views privately to the President on what ought to be done. I think that’s the way the process ought to work. I think the President – this President has made it clear he is prepared to spend whatever time is needed in person, not only with the Joint Chiefs and the Chairman of the Joint Chiefs of Staff, but with General McChrystal, to make sure they have had plenty of time to present their views directly to him. That’s a commitment he has made to me directly, and I intend to make sure that it’s exercised. MS. AMANPOUR: Could I just ask Secretary Clinton what you think about the nature of the debate over the advice? Are not the American people entitled – is this not the premise of American democracy that the American people are entitled to hear the same advice and that members of the U.S. Congress who are going to have to weigh in on this as well should hear this advice? SECRETARY CLINTON: Well, I think that there’s a timing to all of this, and I agree completely with Bob that in the process of trying to tee up these decisions for the President, it is very important that he get the most thoughtful, candid advice from everyone. And remember, he’s getting advice about what will work, not just from the military but from the civilian side as well. 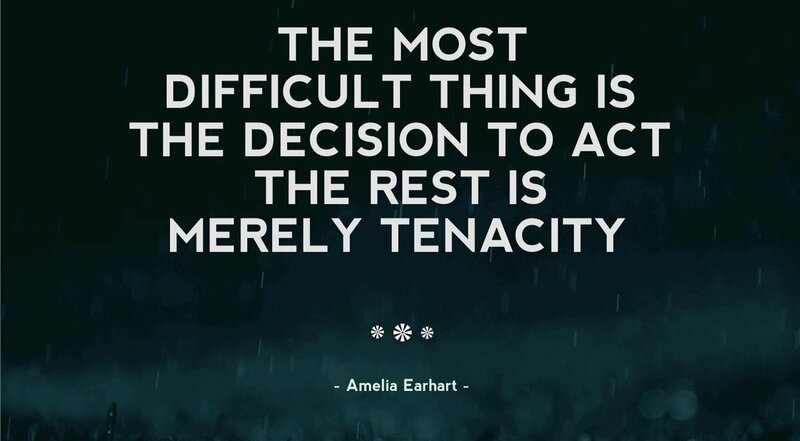 And I think that that is the way to begin any kind of decision-making process. Now, there’s no doubt that as decisions get made, they will be fully available for the public and for the Hill. Consultations are going on with the Hill all the time. But I think it’s important to put this into perhaps some historic perspective. It is unusual for all advice about military matters to be in public for a president. Now, there is a lot of second-guessing that might go on and historical perspective, but this process that President Obama has put together is, I think, one of the most open, most thorough, that I’ve read about. And it is very much an invitation for everybody to come to the table, and that’s what we’re doing. MS. AMANPOUR: We’ll be right back with more on this subject right after a break. PRESIDENT OBAMA: To advance security, opportunity, and justice, not just in Kabul, but from the bottom up, in the provinces, we need agricultural specialists and educators, engineers and lawyers. That’s how we can help the Afghan Government serve its people and develop an economy that isn’t dominated by illicit drugs. And that’s why I’m ordering a substantial increase in our civilians on the ground. That’s also why we must seek civilian support from our partners and allies. 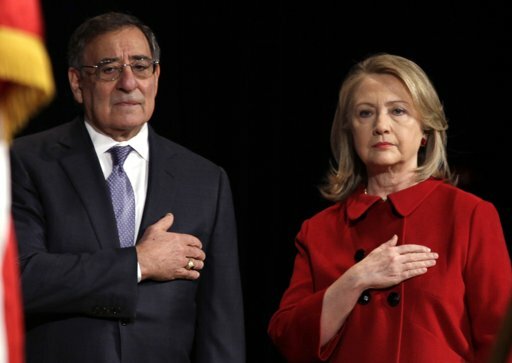 MR. SESNO: Secretary Clinton, you heard there President Obama speaking in March about the need to increase the number of civilians. The civilian surge, it’s called. But the civilian task has been – or civilian personnel has been way under-tasked: when you came into office, 300-some-odd civilians. You’re trying to move to a thousand by the end of the year, or just under it. MR. SESNO: That’s a big increase. MR. SESNO: But compared to the tens of thousands of the military, it’s just a drop in the bucket. Is that really going to change the dynamic? What should the balance be in a conflict zone like Afghanistan if you’re going to accomplish the goals that you’re out to accomplish? SECRETARY CLINTON: Well, Frank, I think what we are attempting to achieve is remarkable in a short period of time. As you say, back when the President made those remarks in March, we had about 300 civilians – Americans – in Afghanistan. We will have close to a thousand in – by the end of this year. But it is a kind of chicken-and-egg issue. We want to focus on development, particularly agriculture, rule of law, good governance, economic development, women’s empowerment – those kinds of issues. But in order to operate in many of the places in Afghanistan, you have to have a level of security. So there has to be a commitment to make an area as secure as possible, because, remember, when an American goes in, that person will always be accompanied by NGOs, Afghans, so the numbers are much bigger than just the direct American hires because there are a lot of Americans working in Afghanistan who work for charities or nongovernmental organizations. But our assessment was that we needed to focus on how to help the people of Afghanistan lift themselves up, have their own opportunities. And it goes hand-in-hand with our military effort. MR. SESNO: Secretary Gates, you in many ways launched this conversation a couple of years ago with a speech where you talked – and you said that we will not kill or capture our way to victory in these places. What should our civilian diplomats be doing that the military is now doing? MR. SESNO: But not enough, right? SECRETARY GATES: Well, let’s step back, first of all, to that point two years ago when I said – when I sort of gave my man-bites-dog speech of the Secretary of Defense saying there wasn’t enough money going to the Department of State. The reality is the Department of State and the Agency for International Development were starved for resources for decades. Now, just let me give you an example. Working for me are 2 million men and women in uniform. 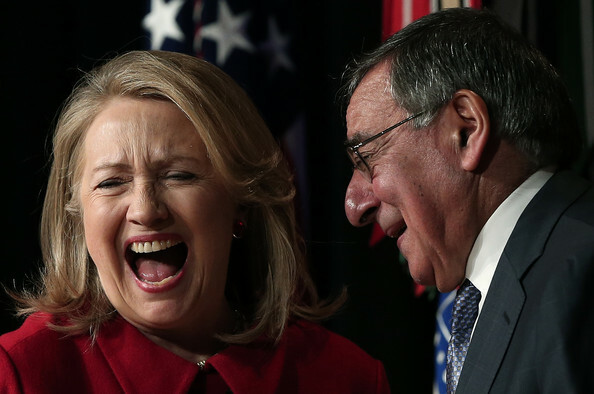 Secretary Clinton has, I think, somewhere south of 7,000 Foreign Service officers. If you took all the Foreign Service officers in the world, they would barely crew one aircraft carrier. So just to keep things in perspective. SECRETARY GATES: Well, and we have partnered. And the reality is that the civilians who do end up in Iraq and Afghanistan in the Provincial Reconstruction Teams and in the other activities, rule of law, agriculture and so on, have a disproportionate impact to their numbers. And I talk to brigade commanders, and one or two civilians working with them have an enormous impact. And these are the colonels who are the brigade commanders who talk about this. So do we want more civilians? Absolutely. We will take all the civilians that we can get out there. MR. SESNO: But my question was: What are the things that the military is now doing that should be handled and are better handled by our diplomats? 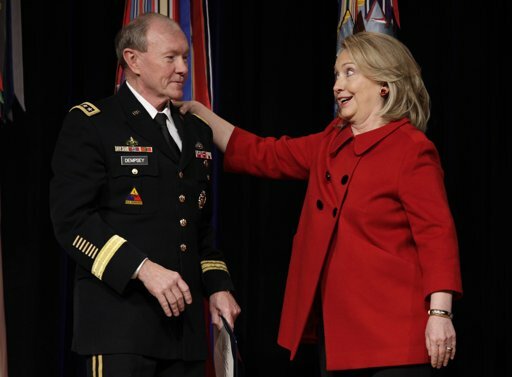 SECRETARY CLINTON: Well, Frank, let me just answer that because a lot of what happens when our military – and they’ve been doing an incredible job against a really ferocious enemy in Afghanistan, particularly along the south and along the border. Without civilians, it’s very hard to make the transition from the soldier or the Marine holding the automatic weapon who has been trying to rout out the Taliban, to going and trying to help a farmer get enough yield out of his wheat crop so that he doesn’t want to grow poppies. I mean, that’s an issue that is very difficult for the military to take on a sustained basis. But in the last several years, in both Iraq and Afghanistan, it was young lieutenants, captains, majors – they were doing that. They were trying to do both jobs. And at a certain point, we need to support them, and I appreciate what Bob said about how, in effect, trained civilians are force multipliers; they can begin to do the civilian interaction with tribal elders and others that will help to make the environment more secure that our Marines and soldiers have helped to create. MS. AMANPOUR: And part of what’s happening is that the Afghan people are not getting as much economic development, therefore not as much help and hope, as one might have thought when this started. So the question I have for you, sir – both of you, actually – is that there’s been some talk over the weekend about how the United States believes that perhaps al-Qaida has been diminished, the threat from the Taliban is not as great as one might have thought. So I want to know what you think about the momentum of the Taliban, their long-term prospects, given the fact that today 80 percent of Afghanistan has a permanent Taliban presence, compared to 72 percent a year ago, and 54 percent the year before that. They seem to be winning territory rather than losing. SECRETARY GATES: I can’t improve on General McChrystal’s assessment that the situation in Afghanistan is serious and deteriorating, and there are a lot of reasons for it. You have to go back to 2003, 2004, in terms of the Taliban beginning to reconstitute themselves in Pakistan and so on. I mean, that’s a historian’s debate. We are where we are. And this – that kind of goes back to General McChrystal’s quote that you aired – you have to start where you are, not where you wish you were. And the reality is that because of our inability and the inability, frankly, of our allies to put enough troops into Afghanistan, the Taliban do have the momentum right now, it seems. MS. AMANPOUR: And do you believe that should – not next week or next month, but should Afghanistan fall to the Taliban again, that it would again become a base for al-Qaida to have its operations there? SECRETARY GATES: I think the thing to remember about Afghanistan is that that country, and particularly the Afghan-Pakistan border, is the modern epicenter of jihad. It is where the Mujaheddin defeated the other superpower. And their view is, in my opinion, that they now have the opportunity to defeat a second superpower, which, more than anything, would empower their message and the opportunity to recruit, to fundraise, and to plan operations. So I think you have to see this area in a historical context in terms of what happened in the 1980s and the meaning of the victory over the Soviet Union in order to understand the importance of this symbiotic relationship between al-Qaida and the Taliban and the other extremists, frankly. MS. AMANPOUR: So you think they would come back if Afghanistan fell? SECRETARY GATES: I don’t know whether al-Qaida would sort of move their headquarters from the FATA to – back into Afghanistan. But there’s no question in my mind that if the Taliban took large – took control of significant portions of Afghanistan, that that would be added space for al-Qaida to strengthen itself and more recruitment, more fundraising. But what’s more important than that, in my view, is the message that it sends that empowers al-Qaida. Al-Qaida, in many respects, is an ideology. And the notion that they have come back from this defeat, come back from 2002 to challenge not only the United States, but NATO, 42 nations, and so on, is a hugely empowering message should they be successful. MS. AMANPOUR: We’ll come back with more from both secretaries right after a break. We’ll talk more about Pakistan and Iran. MS. AMANPOUR: Welcome back. 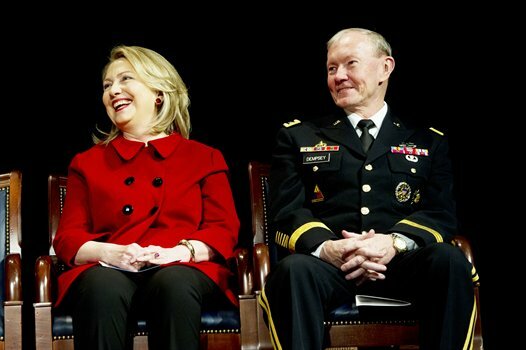 We’re going to continue our conversation with Secretary of State Hillary Clinton and Secretary of Defense Robert Gates. We were just talking about Afghanistan and the Pakistan area, part of your joint solution, hopefully, to these regional problems that exist there. The prime minister, the president, the foreign minister of Pakistan have all said – and have all been very worried – about short-termism, short-timerism from the United States. They are concerned that if you pull back, then they will have to bank not on the U.S. again, but on perhaps the Taliban like they did before 9/11. What do you say to the Pakistani leaders who are now doing precisely what you asked them to do – going after the Taliban, after various militants and terrorists in their own country? SECRETARY CLINTON: Well, what we say is that we want to be supportive and provide assistance, and we want to ramp that up. Just this last week, a very important piece of legislation – the Kerry-Lugar-Berman bill that made a commitment to additional aid for Pakistan’s civilian government and to deliver services to the people of Pakistan – was passed unanimously, on its way to the President to be signed. And you’re right; when we started this review, one of the innovative conclusions we reached was we had to look at both Afghanistan and Pakistan together. Obviously, we had a great commitment in Afghanistan and there had been military assistance and counterterrorism training provided to Pakistan, but there hadn’t yet been a commitment by the Pakistani military and the civilian government like we’re seeing now to go after the extremists that are threatening them as well as beyond their borders. So we are telling them that we think that this is an important commitment that they’ve made. But again, I would just ask you to put this in some historic perspective. We live in the United States on such a fast pace that sometimes a month ago seems like a really long time ago. And in lots of the rest of the world, people remember. And as Bob said, when we partnered with Pakistan to supply the Mujaheddin with the weapons and training that they needed to defeat the Soviet Union in Afghanistan, once that was accomplished, we left. And Pakistan feels like we left them holding the bag because, all of a sudden, they were awash in weapons, they were awash in drugs, they had all of these jihadists who had been trained up in conjunction with us. And we know what happened. We saw that occurring in Afghanistan. So I think it’s rightful of the Pakistanis to say: Well, how long will your commitment be, how much will you be by our side as we take on these threats to us and, by the way, also to you? MR. SESNO: Well, how long is the commitment? Are you prepared to say this evening that the commitment of this country – and the two of you here – to Pakistan is an open-ended commitment; that despite this policy review that’s ongoing, that the commitment to the Afghanistan-Pakistan region is not going to be thwarted by short-timerism, or whatever you want to call it, and we’re there to – that the United States of America is there to stay? SECRETARY CLINTON: Well, what we’re doing is defining our objectives, and we’re then trying to set forth the strategy and the tactics to achieve those objectives. MR. SESNO: If I may, the foreign minister of Pakistan said the fact that this is being debated – meaning this whole policy review – whether to stay or not to stay, “What sort of signal is that sending?” he said. Isn’t this undermining the very Pakistanis whom you have pressured to lean on their own extremists and the Taliban and fight this fight? SECRETARY GATES: Well, first of all, I think that there is absolutely no reason for the President not to consider very carefully the next steps in Afghanistan. I had lunch with the Pakistani ambassador last week, and I made absolutely clear to him we are not leaving Afghanistan. This discussion is about next steps forward, and the President has some momentous decisions to make. And while there may be some short-term uncertainly on the part of our allies in terms of those next steps, there should be no uncertainty in terms of our determination to remain in Afghanistan and to continue to build a relationship of partnership and trust with the Pakistanis. That’s long term. That’s a strategic objective of the United States for a number of reasons that Pakistan is a strategically important country. So I – if it makes them nervous that we’re talking about this for a couple of weeks, frankly, I think that’s a transitory problem. MR. SESNO: I just want to button one thing up. You were talking earlier about your advice and your comments, your public comments to keep the advice to the President private and candid. Are you trying to muzzle McChrystal? MR. SESNO: Will we be hearing him speak publicly again? SECRETARY GATES: I was actually going to pile on to Hillary’s comments earlier before we went to the break. Look, when we did the surge in Iraq, there was no public discussion during that surge by the people involved in that debate. The President made his decisions. The Chairman of the Joint Chiefs of Staff and I then went to the Hill to testify, and General Petraeus then followed us. That is exactly what is going to happen in this instance. There will – I have told people on Capitol Hill, the minute the President makes his decisions, we will get General McChrystal back here as quickly as possible and up on to the Hill, because I will tell you, there is no one more knowledgeable and more persuasive on these issues than Stan McChrystal. But it would put – I believe it would put General McChrystal in an impossible situation to go up in a hyper-partisan environment to the Hill, before the President made his decisions, and put the general on the spot. I just think that’s wrong. I think it’s wrong for General McChrystal, and I think it’s wrong for the President. And as far as I’m concerned in this job, I’ll do everything in my power to prevent that until the President has made his decisions. MS. AMANPOUR: And we’re going to take another quick break. We are going to come back and talk – (laughter) – we’re going to take another quick break, and we’re going to come back and talk about Iran and the agreement that just took place in Geneva. We’re going to ask what exactly was agreed. MS. AMANPOUR: Welcome back. We continue our conversation with the two secretaries sitting here. I want to know, if you can tell us, what precisely was agreed between the U.S., Iran, and the other powers sitting at that table in Geneva. Did they actually agree to ship out their low-enriched uranium? SECRETARY CLINTON: Well, there were three agreements. One, that there would be inspections, and those inspections are going forward and they’re going forward quickly, of the undisclosed site that the President and Prime Minister Brown and President Sarkozy announced a little over a week ago in Pittsburgh. They agreed that, in principle, the Iranians would ship out their LEU for reprocessing to be returned for their research reactor. There will be a team of experts meeting to determine exactly how that will be carried out within 10 days. And they agreed that there will be another meeting, which means that this process doesn’t just drag on without any continuity. So we think that on those three big issues, this was a worthwhile meeting. But as the President has said and I and others have also made clear, this is not by any means a stopping point. There is much more to be done. We expect much more. We know that the Iranians need to understand that they have run a nuclear program that has violated international rules and Security Council resolutions, which they have to bring into compliance, making it more transparent and accountable. So we have work ahead of us, but I think that on balance, what came out of the meeting in Geneva was positive. MS. AMANPOUR: Just to follow up on the low-enriched uranium, you know one Iranian diplomat told the press that actually, no, there wasn’t that agreement. And I’m asking you whether there is some miscommunication. Are they just agreeing to buy enriched – further enriched uranium and not ship theirs out, or do you understand that they are going to ship the bulk of theirs out? SECRETARY CLINTON: Well, nothing is finished until it’s finished. And there’s a meeting of technical experts – I believe it’s October 18th – to see how to put into action what we certainly believe was an agreement in principle. But there’s a lot to be done before that actually happens. MR. SESNO: Do you think the Iranians actually want to resolve this? 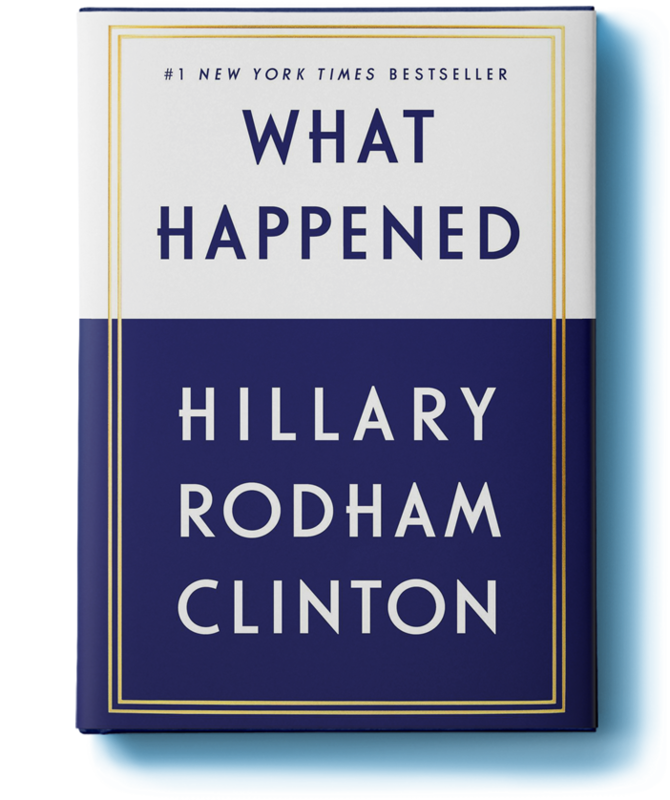 SECRETARY CLINTON: We don’t know yet. We don’t know. MR. SESNO: Do you think this is credible? SECRETARY GATES: I agree with Hillary. I think the jury’s out. And what we have to do is keep them to tight enough deadlines and specific enough requirements that we have some indication of whether they’re serious or not. MR. SESNO: I mean, there’s already – there’s already some substantial criticism of this from some who are saying that this is another way for the Iranians to play for time and that, in effect, they’re being rewarded for having flouted UN resolutions all these years if they can take the uranium that they shouldn’t have enriched to begin with and get it sent out and have it brought back, enhanced, and be able to use in a power plant. SECRETARY CLINTON: Well, but think about what we’re seeing here. And that is that the uranium that they have enriched would be used for a research reactor, which everybody knows they’ve been running – which they are entitled to run – but it would not be used for other purposes. So yes, does it buy time? It buys time. 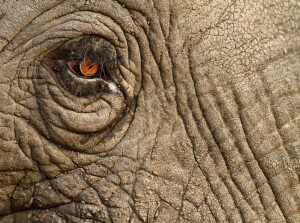 It buys time for us to consider carefully their response, the sincerity of their actions. And we’re moving simultaneously on the dual track. I mean, we always said we had a track of engagement, and we have begun that with this process. But we also said we would be working with likeminded nations and convincing others to stand ready with tougher sanctions were we not successful. MS. AMANPOUR: Can I ask you, Secretary Gates, has your opinion, your intelligence, has anything changed regarding your assessment of whether they are trying to make a nuclear weapon? SECRETARY GATES: My personal belief, all along, has been that they have the intention of developing nuclear weapons. Whether they have actually begun that program or not is hard to say, whether they’ve begun a weaponization program. But I think the question is can we, over time – or can we, in a limited period of time, bring the Iranians to a conclusion that Iran is better off without nuclear weapons than with them. And not just in the security sense, but economically and in terms of their isolation in the international community and so on. And because – I mean, my view is the only long-term solution to this problem, at the end of the day, is the Iranians themselves deciding having nuclear weapons is not in their interest. And if we can’t convince them of that, then an array of other options are open. But our hope, my hope for – ever since I took this job has been that we could, through both carrots and sticks, persuade them of a smarter direction for Iran. MS. AMANPOUR: Isn’t the – I mean, there are basically, I think, three policy options – an Iran with some kind of nuclear capability, a nuclear program but with very strict verification sanctions to try to get them not to enrich, which so far has not – have not worked – plenty of holes, plenty of black market, or the military option, which you yourself have cast out upon its efficacy. Isn’t the real nub of the debate right now to figure out some kind of way of verifying and inspecting and being able to know if they plan to do something else with their uranium other than for peaceful purposes, as they claim? SECRETARY CLINTON: Well, that is, of course, part of the change in calculation that Bob was referring to. We have a very clear objective of trying to persuade the Iranians that their calculation of their security interests and their economic interests should take into account the consequences of sanctions, for example, of increased defensive measures taken in Europe and in the Gulf region. We just worked through this missile defense decision, and clearly, our new adaptive approach toward missile defense is aimed at protecting our NATO allies and most of Europe from a short or medium-range Iranian missile. We have begun to talk with a lot of our other friends and allies about what they need to feel that they would be adequately protected. Now, this is not in any way to concede what Iran should do going forward, because some people say when we talk defensive, that means that we’re conceding that they’re going to end up with a weapon – no, not at all. We are trying to influence the calculation and the decision as to whether or not they should move toward weaponization. SECRETARY GATES: Some people have said, in so many words, that I’m kind of wooly-headed in believing that the Iranians would see not having nuclear weapons as more in their security interests than not. But the question is would the Iranians look at that that way if there were proliferation of nuclear weapons in the Middle East? If some of their neighbors in the Middle East beyond those that now have them would develop nuclear weapons, is that in their interest? Do they think that enhances their national security? I think that’s an argument to be made. MS. AMANPOUR: We’re going to continue this line of questioning right after a short break. MS. AMANPOUR: Welcome back as we continue our conversation. We were talking about Iran and some way of figuring out the way forward about Iran’s nuclear program. So just a quick one before Frank wants to ask you about smart power – I just want to know, is it good enough to have a strict verification protocol? For instance, the additional protocol under the NPT or indeed, you know, to have shipping out of the LEU? Is that good enough even if it’s not perfect? SECRETARY CLINTON: Well, this is a question we’re not ready to answer because we don’t know what the options in front of us are. We don’t know what Iran would agree to. We don’t know what kind of pressure could be brought to bear in case they don’t agree. So our goal is as it always has been – to try to prevent Iran from obtaining nuclear weapons, which we think would be very destabilizing in the region and beyond, and that’s what we are aimed at achieving through this engagement. SECRETARY GATES: And what nuclear sites might they be prepared to be transparent about that have not been declared at this point. MR. SESNO: I want to ask about – both – one last question about Iran, and that relates to what the message is to the people of Iran who have been in the streets, who have opposed Ahmadinejad, who spoke out and in some cases have been arrested, wounded, or worse, standing up to what they see as a stolen election. The United States has a long history of standing on the side of human rights and democratic reforms, and it speaks up for those who have been oppressed. Are you concerned – because some are – that there’s so much effort to negotiate with the government in Iran right now and resolve or at least make progress on this nuclear issue, that those in Iran who want real political change are going to be somehow forgotten or abandoned or will not be the focus of American comment and action? SECRETARY CLINTON: No, because I think we’ve been very clear in supporting the legitimate aspirations of the Iranian people and in speaking out forcefully against the irregularities of their electoral process. But what we concluded is if you look at our dealings with the former Soviet Union, for example, during the Cold War, we always pressed them on human rights and we always talked with them about reducing our nuclear arsenals or trying to have some arms control. These are not either-or. Human rights is at the core of who we are as Americans. We hope for all people the rights that we enjoy here, but at the same time, just as no American president walked away from summits with the Russian presidents working to try to achieve the goals that you could possibly find common ground on, that’s what we’re doing with the Iranians. MS. AMANPOUR: So that was just what I was trying to press with you in terms of a verification, just as with the USSR, when there was a verification system in place where you could know whether there was any dirty dealing or cheating going on in time to respond. MS. AMANPOUR: You seem to be going that way. 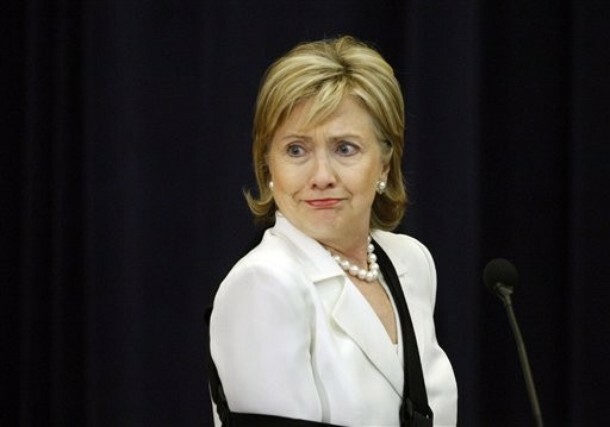 SECRETARY CLINTON: The Soviet Union, yeah. They got a weapon, they were a nuclear weapons power, and then we did deterrents and containment and a lot of negotiation. What we’re trying to do in today’s world, where the information about nuclear technology is much more widely known, certainly than it was in the late ‘40s and early ’50s, we’re trying to convince Iran that this is not in their interest to do. And that is a different perspective than finding out – waking up and finding out the Soviet Union had the A-bomb and we had to deal with this. MR. SESNO: Let’s talk about 21st century diplomacy and how it’s changed and what you’re doing, because you both addressed this – different terminology that’s often used. And one particular area, information, I want to talk a little bit for a moment here. I mean, you call it strategic communication, you call it public diplomacy, but it’s connecting with the rest of the world. It’s learning back from what others are saying. It’s influencing leaders and persuading publics and knocking down myths or propaganda, and maybe in some cases, propagandizing ourselves. A lot of this is now done by the military. There’s no one person in charge of this. How should this very important information battle be waged, and who should be in command? SECRETARY CLINTON: Well, let me give you two quick examples. MR. SESNO: Our State Department? SECRETARY CLINTON: Yeah. A battlefield conflict zone requires the military to respond to rumors, attacks. They have to have a strategic communications effort, but it must be part of a broader national public diplomacy outreach effort. I’ll give you two quick examples. We were just talking about Iran. We learned that during the height of the demonstrations about the election, that Twitter was a major source of information for people who were protesting. And we thought that was a good vehicle, but we were told that Twitter just was going to have to shut down for 48 hours to do some upgrades to the software. So we called and said please don’t shut down because this is a major communications loop for people on the streets. In Afghanistan, what we’ve learned since we got in there – and it’s these great young civilians who work for me in the State Department working with these great young military leaders, working in the – and our forces, they realize that we didn’t have a secure environment for cell phones to operate. So we began looking for places we could put up cell towers. We began looking for how we would incentivize businesses in Afghanistan to spread their cell phone coverage. Why? Because the Taliban and their allies use cell phones to intimidate people. We found out that they were running FM – illegal FM stations literally off the back of motorcycles, and they were telling people “We’re going to behead this person,” and “We’re going to do that.” So we are competing in that space. And obviously, we have to work together, but we have the lead on it because it needs to stand for more than just our military might; it needs to represent all of our national interests and values. MR. SESNO: One of the concerns in the strategic communications field is that in the conflict situation, in too many cases, it’s the man or the woman in the uniform with the gun who is the – in a sense, the front line communicator and also the diplomat, at times. So though you say you want her and State and the diplomats, the civilians, to be in command of that – of necessity, our military, our men and women in uniform, are placed in that role. What should change? SECRETARY GATES: Well, I think in the battlefield – on the battlefield, not much can change. And I think one of the most extraordinary things that we have seen both in Iraq and Afghanistan is the extraordinary innovativeness and sophistication of NCOs and junior officers in terms of interacting with the population, and in terms of trying to build trust. I don’t think it can be any other way on the battlefield. Once security is established, then I think that’s the place where the civilians come in and take the lead in this. But I think one of the things Americans can be incredibly proud of is how well young men and women who are not professionals in the communications world and, frankly, who in many cases don’t have the language and haven’t studied the culture and so on establish personal relationships in these countries that matter a lot, and that create a tremendous foundation on which we can build. We’re doing a lot in the Department in terms of language training, in terms of cultural education and so on for troops that are going out, so that they’re sensitive to the different cultures that they’re dealing with. But in terms of the first-line operators, they’re quite extraordinary. MR. SESNO: I just want to button this up because we are going to move to your questions in a moment, to the audience questions in a moment. But you’ve talked a lot as well about the under-resourcing of our nation’s diplomats. We heard you talk about that a moment ago. But also the need to retool how these – how this toolbox of diplomacy and information and military and economics are all brought to bear to have power and persuasion and influence in the world. You’ve taken that on, sometimes unpopularly and controversially, in your own institution, which you believe needs to change in fundamental ways, whether it’s weapons systems, the F-22. You’ve spoken about how you have to take on retired generals and the military contractors and congressional members. SECRETARY GATES: The Congress is structured in such a way that our committees of a jurisdiction tend to look at things in stovepipes. 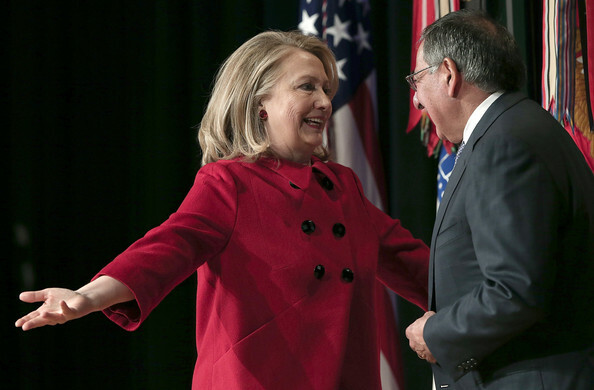 So Hillary’s committees look at foreign policy in terms of diplomacy and so on, and AID. Ours look at it in terms of the military. The intelligence folks have their committees. And so except maybe at the very top level of the Congress, I think there are not people who have the same integrated view of the challenges facing our country and the opportunities we have to deal with them that we do sitting in the situation room. And the question is how do you build a constituency in the Congress over a period of time not only to grow the civilian national security part of our government, meaning the non-DOD part, but to provide the tools that are necessary and that take years to build in terms of talent and capacity, to be able to conduct America’s relationships abroad? And I think that’s a challenge. MR. SESNO: You haven’t answered that. MS. AMANPOUR: No, go ahead. MR. SESNO: In Afghanistan, the notion of bombing from the air and going after militants from the air has caused a lot of civilian casualties and a huge drop-off for American public support amongst the people there. Do you think that it’s possible to continue using that as a primary weapon against militants just in terms of its effectiveness? And do you think that it’s moral to use that as a primary attack against the militants? SECRETARY GATES: Well, I think one of the principal changes that General McChrystal has brought – and I will give General McKiernan credit, his predecessor, for beginning to move away from the use of air power, and particularly in offensive operations. And I think General McChrystal has underscored this, and a central element of his strategy in Afghanistan is to get away from the use of air power and the potential for mistakes that create the civilian casualties, and that every civilian casualty is a strategic defeat for the countries trying to help the Afghan Government and people. And I would just say this: We will continue to use air power to defend our own troops. If they are in trouble, we will use air power to defend them. Where I think General McChrystal has drawn a line is in using air power in offensive operations. MR. SESNO: So let us go now to your questions from the floor. We’re going to ask you to keep your question as – to identify yourself. We have two levels of participants – students from the School of Media and Public Affairs, and from the Elliott School. Give us your name, your school and a brief response – a brief answer, a brief response. We’ll get in as many as we can. Go ahead. QUESTION: Okay. Hi. My name is Caitlin Elms (ph) and I’m a senior here in the School of Media and Public Affairs. I’m from Columbia, Maryland. And my question is for Secretary Clinton. On your first two foreign trips as Secretary of State to the Middle East and Asia, you embedded local bloggers in your traveling press corps from each country that you visited. You also participated in webcasts, where you answered viewers’ questions. Your webcast in Beijing had over 10 million viewers where you discussed climate change. We were just discussing Twitter. My question to you is: How do you see new media in the future of public diplomacy? And what types of strategies do you think would be most effective in the future that use new media? SECRETARY CLINTON: Well, that’s a great question, because I think that new media is the reality. And part of what we’re trying to do is to bring that into public diplomacy and make it one of those tools in the toolbox, to try to not just have government-to-government contacts and official sorts of communication, but really try to reach out to the people in countries to have a better idea of who we are, what we stand for. I think there has been a tremendous opportunity because of President Obama, where people really have opened up to America again. And we’re trying to fill that with content. We’re trying to make it as interactive as possible, give people around the world the idea that we really care what they think about. I mean, we may not always agree, but we’re back to listening, we’re back to engaging. Because in today’s world, there’s too many sources of information coming at people, and we need to be part of every possible approach that can be taken. So I think it’s critical and we’ve got some great young people at the State Department who are designing this for us. And I feel very good about the start that we’ve made, but we have a long way to go. SECRETARY CLINTON: We’re hiring. That’s right, we are actually hiring. We’re increasing – all things hopefully coming through in our budget, we’re increasing the numbers of Foreign Service and Civil Service personnel because the need is so great. QUESTION: Hi. My name is Carlos (ph). I am from Sao Paulo, Brazil, and I’m also in the Elliott School. My question is for Secretary Clinton. Madame Secretary, what do you think of the political crisis in Honduras at the moment right now, and the apparently intensifying battle between left and right politics in Latin America? What does that mean for democracy in general in Latin America, and also for U.S. relations with Latin America? And do you think the current situation in Honduras could foreshadow similar events in other countries, specifically those led by leftist presidents in Latin America? SECRETARY CLINTON: Well, I’m glad you asked that because very often we don’t talk enough about our nearest neighbors in this hemisphere. And we’ve spent a lot of time with this new Administration working with our friends and allies, because you’re right, there has been a pulling away from democracy, from human rights, from the kind of partnership that we would want with our neighbors. So in Honduras, we are standing for the principle of democratic and constitutional order. And we have done that, I think, much to the amazement of many of the very leaders you’re talking about who have become increasingly anti-American in their actions and their messages. So I think it’s important that the United States do everything we can to prevent either the hijacking of democracy by people who get elected once and then decide there never should be a real election again, or by the return to military coups, where people are elected and even if you disagree with them, they should finish out their term in an orderly way. So we’re working very hard to reach a conclusion in Honduras that will permit the elections to go forward, that will follow what President Arias of Costa Rica did in the San Jose Accords to try to get Honduras back on the path to a more sustainable democracy. The people in Honduras deserve that. They really have struggled hard to get to where they were before there was the disruption and the exiling of President Zelaya. And we hope that we can help them get back on the right path. MR. SESNO: We have time for one last question. Go ahead. QUESTION: Good evening. My name is Seth Hyman (ph). I am a junior in the Elliott School of International Affairs. I’m from Bay Ridge, Brooklyn. My question tonight is to you, Secretary Gates. You both mentioned how you were pleased with the Pakistani Government in how they were combating the Taliban in Afghanistan. That being said, it is a known fact that the Pakistanis are always worried about the Indians and their – and their presence, especially being a nuclear power. I was wondering if you could talk about if you believe that the ISI and other members of the Pakistani military apparatus – if they are still supporting the Taliban as a counterweight to India? SECRETARY GATES: Well, you know, I first started dealing with the ISI when we were partnered working against the Soviets and supporting the Mujaheddin in the early 1980s. And Pakistanis obviously established very close relationships with a variety of the Mujaheddin groups – Gilbuddin Hekmatyar and a number of others. There obviously is the question of whether they have sustained those relationships and what the nature of those relationships might be. We talked to them about this. And I think that the clear path forward is for us to underscore to the Pakistanis that we are not going to turn our backs on them as we did in 1989 and 1990. We turned our backs on Afghanistan, we turned our backs on Pakistan. They were left to deal with the situation in Afghanistan on their own. Their worry is what happens in the future – will we be there, will we be a constant presence, will we be supportive of them over the long term? I think in terms of the way they look at Afghanistan, the way they look at the region, depends on the degree of confidence that they have in us, that we will be a reliable partner of theirs going forward. I think that shapes the view of the Pakistani Government, and that includes the ISI. MS. AMANPOUR: There is so much more to talk about. But thank you both very, very much for joining us. 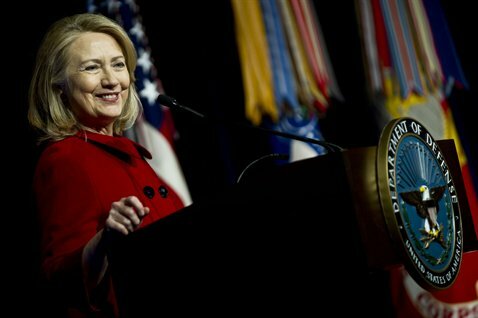 Thank you, Secretary of State Hillary Clinton. (Applause.) Thank you, Secretary of Defense Robert Gates. Thank you to Frank Sesno and to all of George Washington University. Good night.